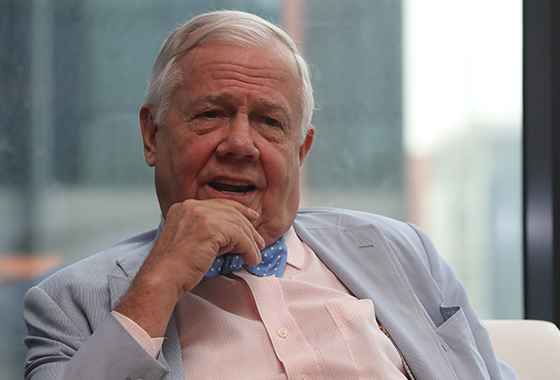 The Korean Peninsula will become the most appealing market for at least 20 years if the two Koreas become one, according to American businessman and legendary investor Jim Rogers. Korea “is going to be the most exciting country in the world for the next decade or two,” Rogers said at a Korean TV show ‘Tonight – Kim Jedong’ on Wednesday. His confidence in one Korea is based on his belief that North Korea today is what China was in 1981 and everyone in the North wants change and is ready for one, he added. Once the world’s most secluded state opens up its economy, its abundant natural resources, and cheap and young labor combined with its Southern neighbor’s immense capital and world-class business management capabilities would bring economic prosperity to both Koreas. He added that investing in North Korea carries “less risk” because everything is so cheap now. Rogers, an iconic figure in Wall Street along with Warren Buffett and George Soros, has been showing a great interest in investment in North Korea for years. He became a more avid fan of the Hermit Kingdome after the first ever summit between Pyongyang and Washington in June last year. He joined Ananti, South Korean resort and golf course operator that also owns management rights of a resort in the North, as an independent director last year. Regarding the global economy, he warned that the debt everywhere “has skyrocketed” since 2008, and if there is another global economic crisis, it would be much worse. Except for North Korea, he said he is paying attention to agriculture and Asian tourism, especially in South Korea. He also said that companies who can address China’s environmental problems could make a fortune. “Buy things that are cheap but showing positive changes,” he advised as investment tip. When asked to give some advice on the Korean economy, the nation should “keep its debt down” amid the economic slowdown and growing uncertainties.